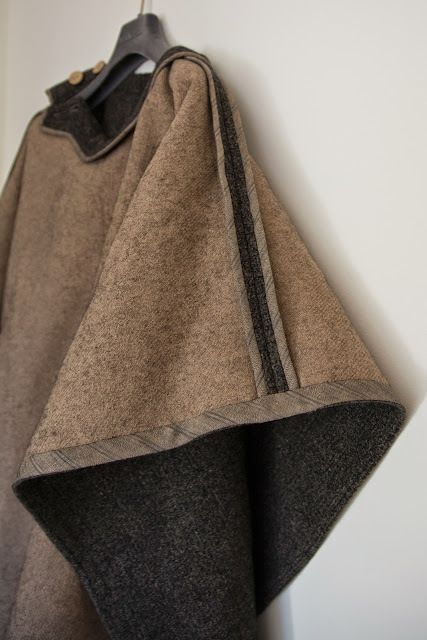 When I found this gorgeous double faced Italian wool coating fabric at The Fabric Store I knew it would be perfect for a Carnaby Cape. But,... I already have one and so I bought some of the fabric ('cause it was half price!) and stashed it away for a mother's day gift. Well I was a little late due to all that cross stitch, but on the third Sunday in May my mum got her winter cape. Against black clothes it's looking quite brown, but it's really a kind of charcoal grey/brown and the main side has a soft, cuddly face almost like a cotton fleece. 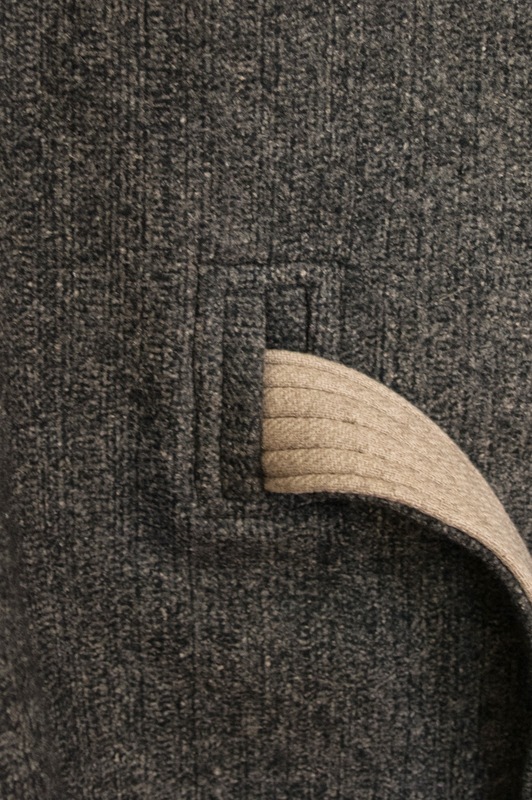 The reverse side is a true camel colour and has a slight herringbone pattern to it. It's thick, warm and divine. The kids would happily have kept this fabric just for rolling themselves up in. 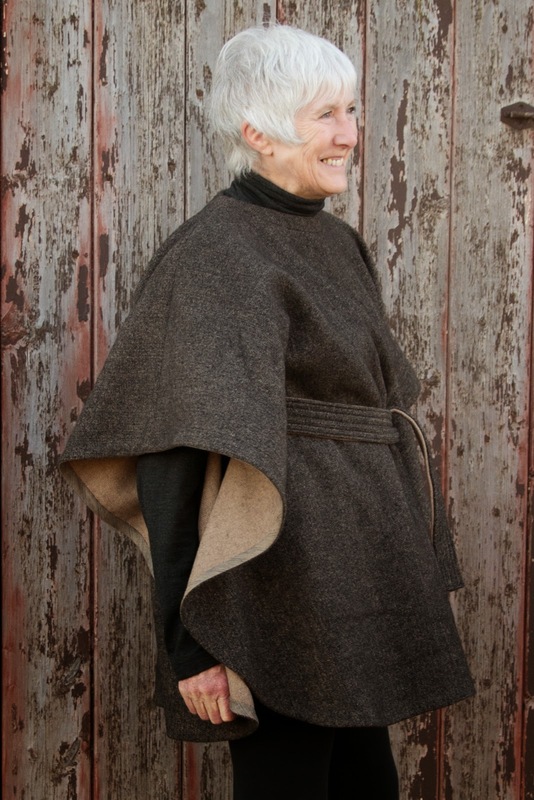 To show off the double sided nature of the fabric, the Carnaby Cape seemed the perfect choice. However, I didn't get my fastidious approach to tasks as a gift from aliens. It was most certainly inherited. So, if I was going to sew for my mum it was going to have to be good enough and there'd need to be some alterations to the finishing of the cape. Also, due to the two sided nature of the fabric it wouldn't allow for the hem to be left raw as per the pattern. It was going to need at least hemming in some way. I hunted through my stash to see if I had a suitable fabric and discovered that a pewter/bronze striped linen was perfect if I used the reverse side. .... and all around the front and back facings and button tab too. Don't ask me how, but both times I've made this cape I've managed to get the buttoning side reversed. It's meant to button on the right shoulder not the left. I cut the facings the wrong way up then have to imagine all the instructions in reverse. It would surely be easier to get it right from the start. For reference: Cut the already block fused facing pieces form the fabric right side up! 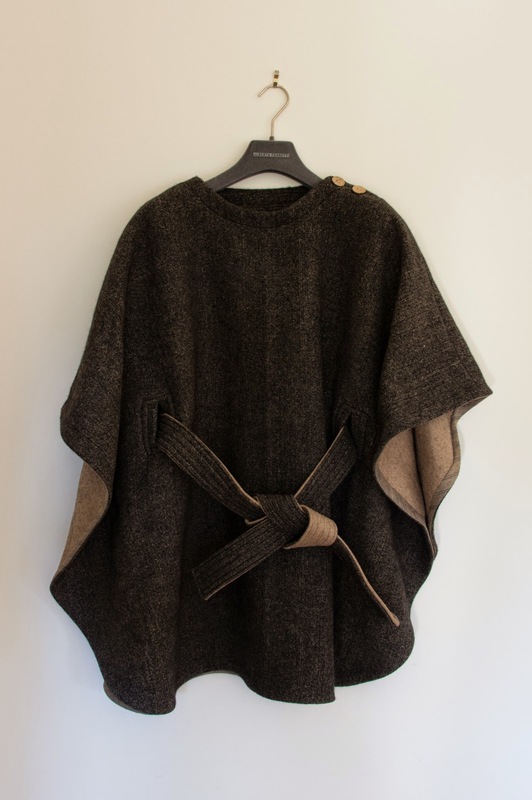 The buttons are actually the same decidedly brown buttons that I used for my cape (I'd bought 4 when I only needed 2) but when used upside down they are perfectly camel coloured. The bound buttonholes really are lovely to sew. Knowing that the cape wouldn't be lined like my one is, I paid more attention to the insides and was careful not to use too large a piece of interfacing that would stick out beyond the welts. 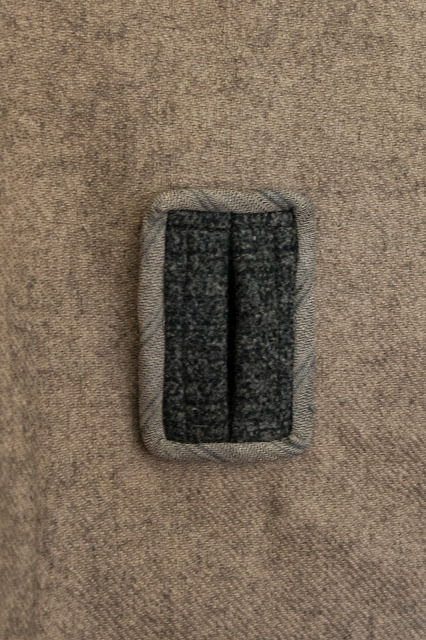 Again for reference; 6x8cm rectangles of interfacing are perfect. To highlight the double sided fabric I cut the belt from two 10cm wide strips instead of 1x20cm wide strip. I folded each strips long edges to meet off centre. That way, when I put the two strips together I can offset the joins so that there isn't a weak spot or ditch in the centre of the belt. Yep, I bias bound the bound buttonholes! I was apprehensive that stitching from the inside might result in some very wonky rectangles on the outside. But since the welts were nicely centred, when I stitched in the ditch to hold the bias binding in place it turned out to be as good a topstitch around the welts as if I'd done it from the cape's right side. Phew. 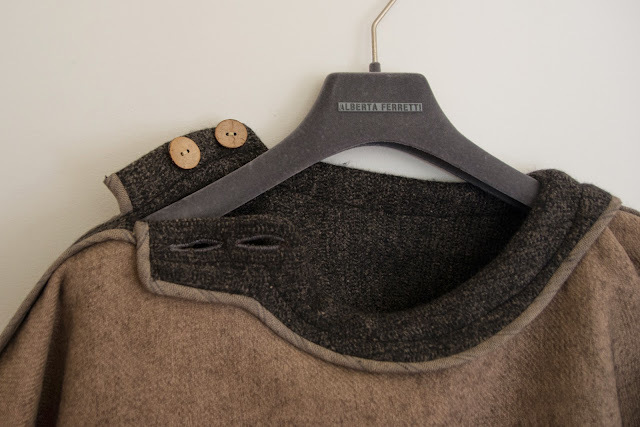 This wool is a bit heftier than mine and doesn't drape quite as softly. But hopefully, out in the country, in the middle of winter it will be an easy thing to thrown on to brave the cold outside. 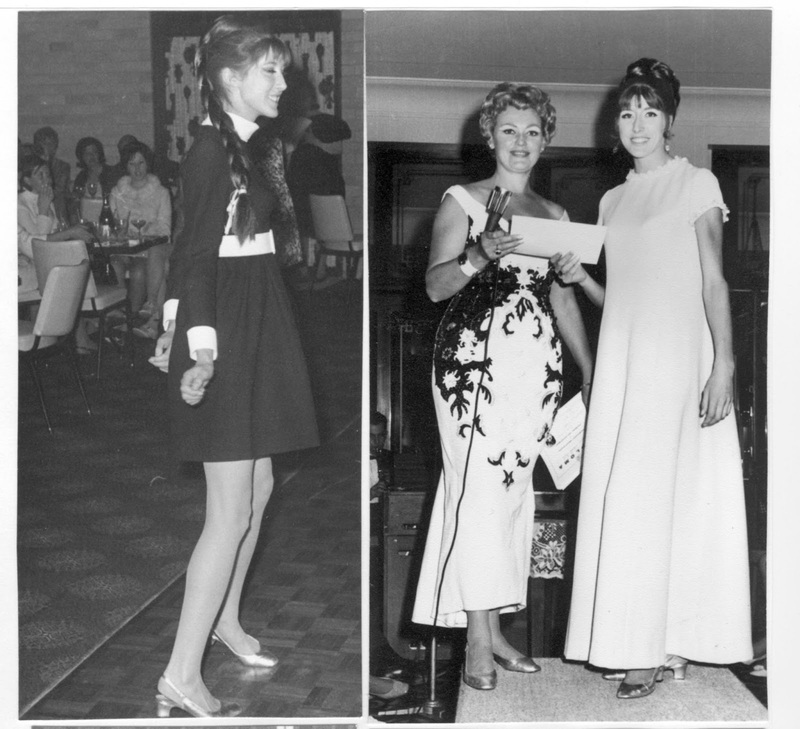 And speaking of brave.... thanks to my mum for making her first modelling appearance on the blog. It's kind of a condition of receiving anything handmade that you have to wear it for a blog photoshoot. She did a great job modelling, don't you think? oh it's gorgeous! It's sure to be much loved for years to come especially with the beautiful finishes you used. Lucky mum! Thanks Mel. I'm wearing mine right now, so I hope my mum's one proves to be as useful. happy weekend and well done, Shelley! it was your best work! Yeah, pity I missed out on inheriting those skinny pins hey. I enjoyed making this, it was just the right balance of nice fabric, good pattern and options for making it a bit extra special. My ex school principal said it best when he said "I like you kids. I may not always like what you're doing, but I like you"
Thank for a lovely (and superbly well made) warm and cosy Cape. It's perfect for the cold wintry weather in our little country town. I'm very proud of it ..... and of you! And I'm very flattered that you went to the trouble of getting a blogger ID just to leave a comment! Cheers mummy!! Well that's just fabulous! Beautiful details. I want one for me :) And what fantastic genes you come from Shelley! Thanks Ocky. I wear my version of this cape quite a lot when it gets cold. just like a blanket only a bit more stylish! Oh my gosh. The insides are even prettier than the outsides! And I mean that! I would want to wear it inside-out! Your mother looks absolutely FABULOUS in that cape, too. That last shot of her in the cap is fierce! Love it!!!!! I'll make sure she knows you said so Inder! Thanks. The fabric was too lovely not to let the insides show and since I'm such a stickler for neat finishes the insides had to be worth showing! 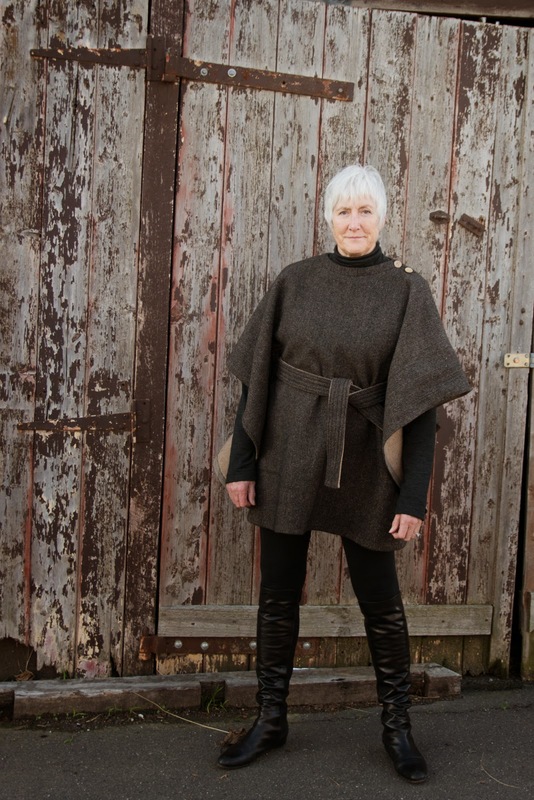 Gorgeous cape, your Mum looks thrilled with it and is styling it perfectly. Thanks Sharon. I was pretty sure no matter what she was wearing it would work for a photo shoot, so no styling needed, just a predictably stylish mum! What a wonderful daughter! The cape is fabulous and your mother is quite adorable it in! It looks to be perfect for wintery wear. Your finishing is incredible! Beautiful work, and beautiful lady! Aw thanks. Now I just need to work out how to fit things other than capes and I'll have grown up sewing under control, right?! I'll pass on your compliments to my mum! No half arsed efforts here ;) Love it!